Forty-six more teachers in the Long Beach Unified School District got their classroom wishes granted as part of a recent $29 million donation that funded all projects in one fell swoop on the national DonorsChoose.org crowdsourcing website. The donation by Ripple, a San Francisco-based cryptocurrency and international payment company, was announced on “The Late Show with Stephen Colbert” on March 27. 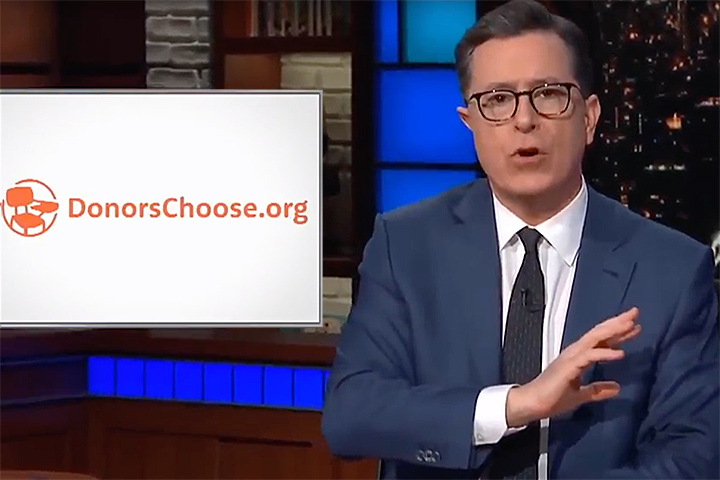 Colbert is on the DonorsChoose board. In 2015 he funded all the DonorsChoose requests in his home state of South Carolina, for a total of about $800,000. In all, Long Beach’s 46 teachers will receive $46,561 for 51 projects. DonorsChoose also has funded hundreds of other local classroom projects in recent years. The organization, founded by a Bronx public high school teacher in 2000, is a nonprofit charity that connects K–12 classrooms with donors who are eager to provide resources that students need. Funded items include art supplies, sports equipment, musical instruments, lab equipment, educational kits and games, instructional technology, books and more. More than 11,000 public school districts in the United States have used the website DonorsChoose.org to receive more than $600 million in donations toward classroom materials and experiences. GENEROUS DONATION – Stephen Colbert of “The Late Show” announces a $29 million donation by tech firm Ripple to support the nation’s teachers and classrooms, including dozens in the Long Beach Unified School District.